On this page, we take a look at how to knock money off your home phone and broadband bill, just by using a BT Credit Card. This is a handy little money-saver... If you use a credit card (and who doesn't? ), make sure you're rewarded! BT has partnered with MBNA to bring you the BT Credit Card, a Visa card that rewards your loyalty. BT Credit Card No Longer Available. "BT and MBNA have always worked together to bring you the BT Credit Card and we have now mutually agreed to close this programme on 10 November 2012." Money off your home phone and Broadband bill each year. There's no annual fee for the BT Credit Card. If you get your phone or Internet service from BT, get a BT Credit Card and reduce your BT home phone and broadband bill just by using your credit card as you'd use any other card. Spend £200 a month on your credit card and get rewarded with £4 off your quarterly BT bill. Full details, including terms and conditions, and current APR, can be found on the BT Credit Card site. BT is slowly invading your home - as well as phone and broadband, you can now get digital telly from BT in the form of BT Vision, and more and more homes across the UK now have a shiny black BT Home Hub hiding away somewhere supplying wireless Internet access. Now, BT has teamed up with a major credit card partner to infiltrate your wallet too - and if you're already with BT, then using this card can save you a few quid off your BT bill. Powered by MBNA, the BT Credit Card is a standard Visa card that rewards you for making your everyday purchases on the card. BT will cut 1p off home phone or BT broadband bills for every £1.50 that you spend on the card. Admittedly, there are some better cashback credit card offers out there if you look for them, but for convenience, BT's Visa Card is a great way of saving some cash without much effort or hassle. 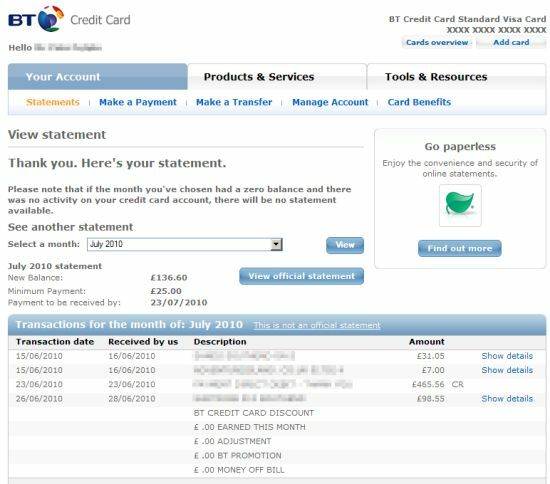 To benefit from using the card, you obviously have to get your phone or Broadband from BT, but more importantly, you have to be in a position to pay off your credit card balance in full each month. If you don't, the interest you pay could end up exceeding the money you save off your bill. At launch, the card offered 12 months 0% balance transfers. The BT Credit Card behaves in much the same way as any other credit card, and you're able to manage your credit card online. Also, if you're an environmentally-friendly type, you can also opt to go paperless. The online credit card portal allows you to look back at your previous statement and recent transactions. You can browse and download the last year's worth of statements, transfer a balance, make a payment, add an additional cardholder, view your PIN, apply to change your credit limit, and download transactions in a format that can use imported in a finance package such as Microsoft Money or Quicken. So, is the BT Credit Card worth a look? If you get your phone or broadband from BT, and typically pay off your credit cards in full - then yes, it's worth going for. There's nothing to lose, no annual fee, and you can save simply by using your credit cards as normal each month. The BT Credit Card is a Visa card, and is available in a choice of colours: Black, Silver, Green and Girlie Pink.